Thee #1 Yggradsil slot. Great design, Mystery win feature, 98% payout and the trademark Jokerizer Mode – it’s no surprise that Jokerizer slot quickly gained popularity among online casino players. You can play it for free here on SlotMachinesOnline.co or play it for real money in one of our top Yggradsil casino sites. One warning for those of you that are eager to play: using the Jokerizer mode at all times make this slot extremely volatile (see the bottom paragraph), so please be careful. 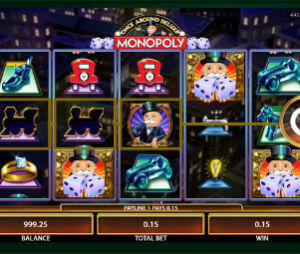 Jokerizer is a 5 reel, 10 paylines video slot. As it is common with Yggradsil, the paylines go from left to right and right to left. The game has only 7 symbols – 6 regular ones and the scattered Joker, which is the one that activates the Mystery Win feature. You should notice that since the number of lines is fixed, the minimum bet on Jokerizer slot is quite high – $/€ 1 per spin. The maximum bet is $/€20. During the regular play, Mystery Wins feature is triggered by 3 Joker symbols which can appear on reels 2,3 and 4. When activated, it will give you at least 1,000 coins, meaning x100 your bet per spin, and it goes up to a maximum of 6,000 coins. If you are lucky to get the three scattered Jokers aligned, horizontally or diagonally, you will be awarded the maximum 6,000 coins win. The special feature of this game. It became so successful that it was reproduced in additional Yggradsil slot, such as the progressive The Dark Joker Rizes slot. How it works? Simple. After every win, you will have an option either to collect your winnings or to use them to activate the Jokerizer mode. If you choose to activate it, you will see the special balance appear at the top part of the screen (see the image below). Each spin here will cost you 20 coins, twice more than the regular spin. On the other hand, the expected return here is higher. First, more scattered Jokers added to the reels. Second, you need only 2 scatters to activate the Mystery Win feature. Mystery win feature for 2 scatters works the same way, the only difference is that the minimum win is 20 coins. The maximum remains 6,000. The Jokerizer modes ends when you run out of the special balance or until you hit a Mystery Win of 1,000 coins or higher. Of course you can also choose to terminate it and collect your winnings at any time. So what is the best way to play to increase your payout? The answer is to use the Jokerizer Mode as much as possible. The payout during the mode is higher and therefore it’s worth playing it every time until you reach the maximum win amount. This strategy has its drawbacks. Basically, you will sacrifice all frequent small wins to get few big ones. That means that you’ll make this slot highly volatile and you need enough balance to get through the hard times. But, you should remember, since your bet is fixed on 10 coins per spin, wins of 1,000 to 6,000 coins wins are worth 100 to 600 times your bet per spins. It’s enough to get only one of those every 100-200 spins to make it worth your while. Of course, it’s up to you to decide how you wish to play. You can choose to use the Jokerizer only once in a while when you feel lucky and make the play more smooth. One important thing to notice: if you choose to play using the Autoplay mode, by default it will use the special mode every time.